Which Is Healthier, Lima Beans or Soybeans? Are Black Beans & Lima Beans Good for Your Diet? A bowl filled with black beans. 1 Which Is Healthier, Lima Beans or Soybeans? 2 What Are the Benefits of Great Northern Beans? Describing black beans and lima beans as healthy and nutrient-dense doesn't begin to give you a complete picture of the value they bring to the table. A very-filling 1-cup serving has a little more than 200 calories and nearly one-third of your daily carbs in the form of energy-providing complex carbohydrates. They’re also good sources of protein, fiber and a range of nutrients. It doesn’t matter whether you prefer black beans or lima beans: They have almost identical nutritional profiles. Black beans and lima beans provide inexpensive, lean protein. Both have less than 1 gram of fat and yet deliver 15 grams of protein in a 1-cup serving. Women should consume 46 grams of protein daily, so eating 1 cup of beans provides one-third of their daily intake. Men get about one-fourth of their daily intake because they need 56 grams of protein daily, according to the Institute of Medicine. Even though they're not complete proteins, both beans are good sources of lysine, which is the amino acid often lacking in vegetarian diets, notes VeganHealth.org. Fiber’s role as roughage is vital, but preventing constipation is only one of its health benefits. Soluble fiber helps keep your blood sugar balanced, making it an important nutrient for anyone with insulin resistance, prediabetes or diabetes. It also significantly contributes to your cardiovascular health by lowering levels of cholesterol. 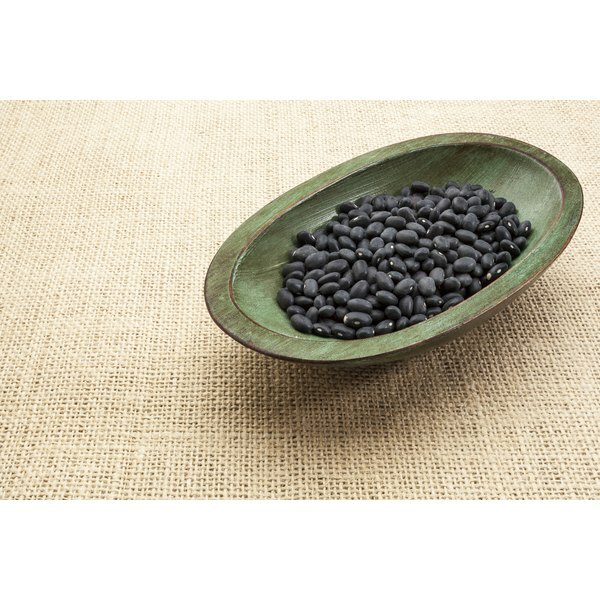 Beans of any type, including black and lima beans, are at the top of the list for fiber content. One cup of black beans supplies 15 grams of fiber, while lima beans have 13 grams. These values represent at least half of women’s and about one-third of men's daily intake based on recommendations to consume 25 grams and 38 grams, respectively. Both black beans and lima beans are good sources of potassium, magnesium, iron and zinc. They’re especially rich in iron, which transports oxygen in your body, prevents anemia, helps metabolize energy and strengthens your immune system. You’ll get 3.6 milligrams of iron from 1 cup of black beans and 4.5 milligrams from the same portion of lima beans. Premenopausal women need more than double the amount of iron compared to men -- 18 milligrams vs. 8 milligrams -- so both beans provide at least 20 percent of women’s recommended dietary intake and about half of men’s daily iron requirement. Magnesium and potassium support your cardiovascular health by lowering your blood pressure, according to Colorado State University. They’re both excellent sources, but black beans have twice the amount of folate as lima beans. Folate protects your heart health, helps form DNA and is essential for cell growth and healthy red blood cells. Women who are pregnant or may become pregnant need to be diligent about their folate consumption because it prevents birth defects that occur in the first few weeks of pregnancy. You’ll definitely boost your folate intake by eating beans. You’ll get 256 micrograms from 1 cup of black beans and 156 micrograms from lima beans. Your recommended dietary allowance is 400 micrograms of folate daily. What Are the Benefits of Whole Grain Rice? Does Eating Walnuts & Almonds Help With Skin Care? Why Is Pomegranate Good for You?